The Iron Kingdom has long been without a ruler, since its last emperor and his entire family was massacred by a revolt of Metals—sentient androids—while the Plague decimated the land. Now rogue Metals are HIVE’d. Today is a momentous day, for the Grand Duchess is going to choose her heir, the thirtieth Emperor of the Iron Kingdom, the one to wear the Iron Crown. The Crown has one criteria for its wearer, however . . . his touch must not cause it to rust. It’s into this scene that the outlaw orphan Ana and her companion, an unHIVE’d Metal called D09, appear. Raised aboard the Dossier, a transport ship captained by the pirate Siege, Ana and Di have been together as long as either can remember. Di is Ana’s best friend, and she loves him more than she could any human. Now he’s beginning to glitch, and she’s looking to steal information that will enable him to be repaired. Robb Valerian is a bad seed. He knows it, his overly-ambitious mother knows it, and his older brother never lets him forget. He’s also an Ironblood and one of the surviving members in line to inherit the throne. It’s Robb’s brother, Erik, who’s going to get that honor, however, not that he deserves it. Jax is a Solani, one of that race gifted with the awful ability to foretell a person’s death by touching them. As a result, Jax makes certain he never comes in contract with bare flesh. That may become a problem when he helps rescue Ana and D09, and a certain Ironblood gets in the way. Somewhere in the reaches of space the hulk of a crashed spaceship manned by Robb’s father holds the key to all their destinies, as well as the secret of what really happened to the royal family. Finding it will change the entire Iron Kingdom forever. The search throws the three together in a race against time: Robb to prevent his brother from becoming the new emperor; Ana to keep Di from that terminal glitch, and Jax in overcoming his heritage and admitting his feelings for Robb. Personal intentions are momentarily thwarted, however, when the discovery of a medallion proves one of the royal children survived. The medallion is around Ana’s neck, making the outlaw girl Ananke, first daughter of the Armorov bloodline born in a thousand years, and the kingdom’s true ruler. This certainly put brother Erik out of the running, but if Ana is Ananke, who is D09? The metal’s identity is more of a mystery, and will cause Ana greater heartbreak than losing him to that deadly glitch ever could. In the midst of this chaos, another claims the throne, someone else whose touch doesn’t rust the crown. What follows is grief and betrayal, love and awakening trust, and the discovery of allies who’ll follow Ana to the finish of the adventure, whether ending in life or death. 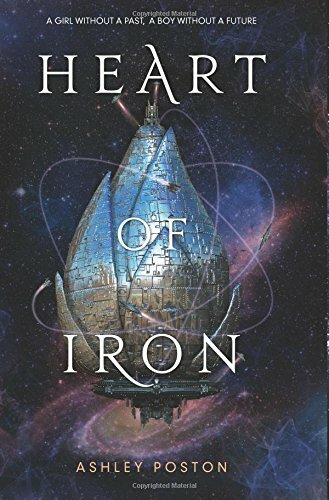 Heart of Iron is a brilliant and fanciful young adult novel inspired by the supposed survival of Anastasia, daughter of the last Romonov ruler of Russia. Setting her adaptation of that story in a futuristic dystopian society has given author Poston freedom to weave her own version into something both exciting, romantic, and intriguing. The characters, even to the most minor ones, are given unique delineation, making them come alive on the page. With specific chapters told from each main character’s points of view, the reader gets several perspectives of events for a well-rounded and complete picture of the story. Instead of having the narrative stop with the revelation of Ana’s identity, however, the author makes another twist and continues it past the expected ending. Solving the mystery of what actually happened to the Royal Family, the discovery of who was responsible, and untangling the intricate riddle of D09’s true identity leads to a startling dénouement heralding the next episode in what promises to be an exciting new series. “Di’s memory core pulsed in her grip, beating softly, reminding her who she was, and what had been taken, and of a Great Dark now sitting on the throne. ‘—and the royalty,’ Jax added. Here’s looking forward to reading how she does it.